while I whip our little bathroom/laundry room into shape! 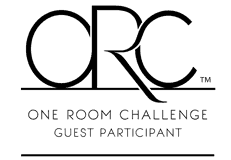 For my fifth time, I’m joining the One Room Challenge created by Linda at Calling It Home, to makeover a room in 6 short weeks. I’ll be posting my progress every Thursday and sharing lots of ideas for transforming a space yourself! Six and a half years ago we traded in our big, young house for an 80s fixer upper with a smaller mortgage and tons of potential, and I’ve been tearing it up and putting it back together ever since. 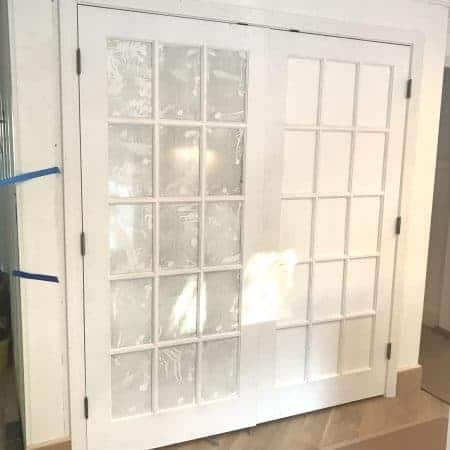 I really wanted, and had to talk my husband into, a project house, and WOW did I get one!!! When we moved here, nearly every surface was covered in some form of peach paint or orangey oak…. even the walls in the garage, the unfinished basement’s cement walls and the kitchen countertops. 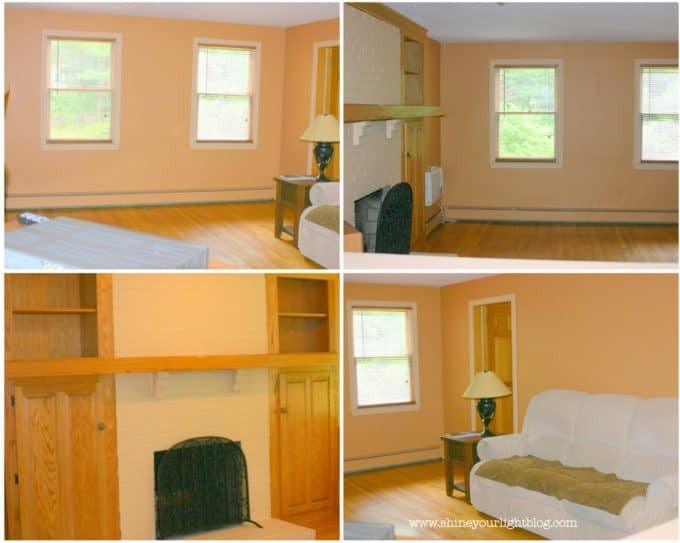 It was probably really nice and cozy when the former homeowner had it all decorated, but it was not my color palette. I spent that first year painting everything in sight so I could start with a blank canvas. This is a good solid house but it’s as basic as you can get – devoid of any architectural details. One of my goals is to add character and detail to it armed with my amateur carpentry skills and as much millwork as the budget can afford! Right off of our kitchen and family room is a half bath with the laundry behind bi-fold doors (whoever dreamed up putting the laundry area in a room that all your guests will use should be smacked. 🙂 ). I slapped some paint on the walls, painted the vanity, did a wee bit of placeholder decorating, and then turned my attention to bigger issues around our house. And now at long last it’s time for this little bathroom to shine. This is the design I shared a month or so ago and I’m so excited to get started on it!! The plan is to keep the existing vanity and countertop, and address the walls, window, lighting, floor and color palette! I’d really love to do a square board & batten style wall treatment…..
but I might have to get creative with this project because the toilet is scooched up right against the wall, which is severely messing up my batten placement. Stay tuned!! 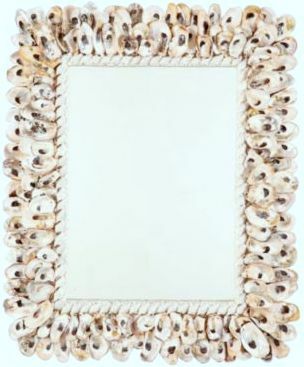 I’ve already made one shell mirror and if my Cape Cod family comes through for me with buckets of oyster shells I’m going to try another one inspired by this discontinued Ballard Designs mirror. 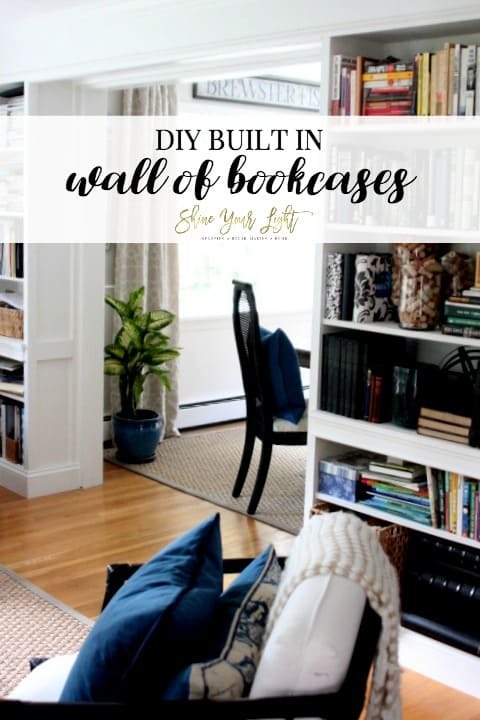 And the big DIY decision yet to be made…..
I’m still mulling over whether to tackle the floor, which is currently hardwood-looking laminate that runs through our kitchen and into the bathroom. We’re definitely going to be replacing the kitchen with hardwoods, eventually, but I don’t want real hardwoods in the bathroom, especially around the toilet. Too high maintenance! I have boys. I’m a realist! 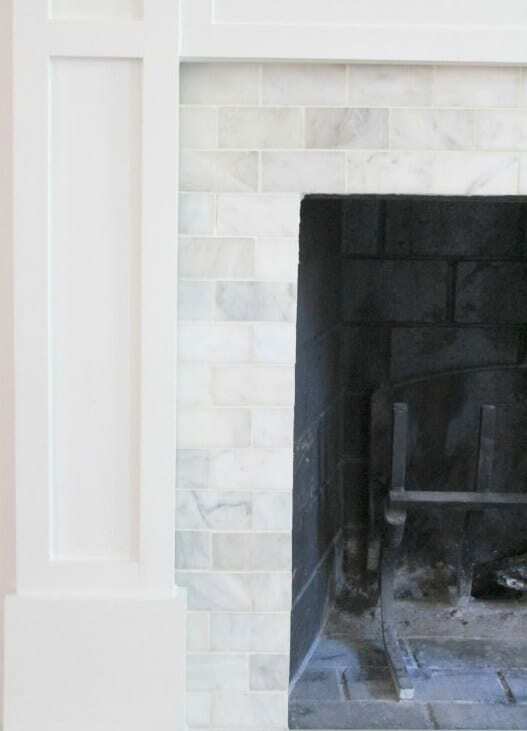 I’m leaning towards installing something like the tiles I used on the fireplace makeover…. 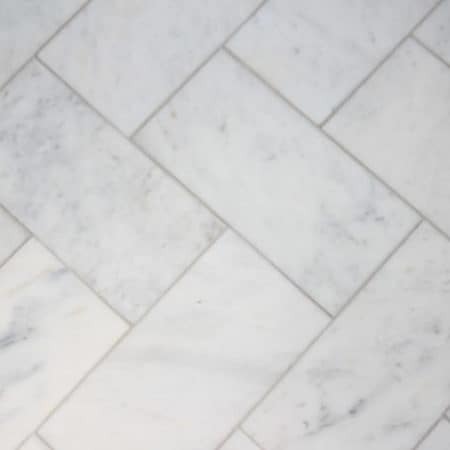 or these 2″x4″ marble tiles that I used on the surround. I like the slightly softer color palette of these and think they would be really pretty in a coastal-inspired room. I also have to buy a new (white!) toilet, decide what to put on the window, whether I want to invest in an electrician wiring lights on either side of the mirror, what I’m going to do for art….phew! Lots to do!!! Come on back next Thursday and see my real life renovation progress! I’m so excited to see what other fun projects are in this round of the ORC. 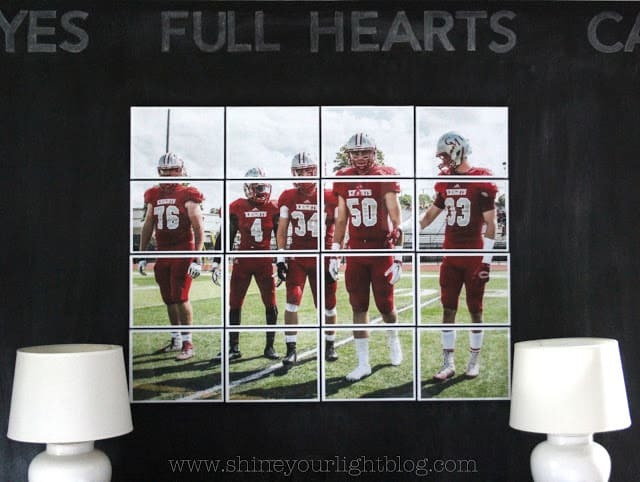 Check them all out at Calling It Home and best wishes to everyone tackling a room this season! I’m excited to follow along with your ORC bathroom. 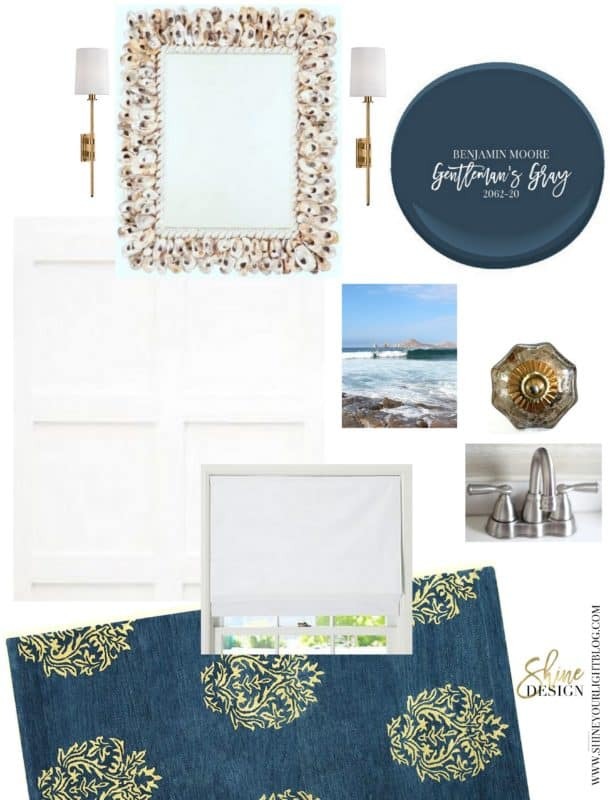 I am also doing our bathroom, and have similar coastal ideas for my space. Such an inspiration! Thanks! Oh Julie yay!! We can tackle our coastal bathrooms together! Looking forward to seeing what you have planned! So exciting Lisa! I chickened out again for this ORC round…one of these days… I love your ideas and the paint color is perfect. I had been eyeing up that rug in beige for my family room but wanted to see it in person before getting a large size. Can’t wait to see your bathroom transformed! Thanks so much Shelley! I hope it goes as planned. I haven’t seen that rug in blue yet and don’t know if it will work. I really want to use that paint color so I’m working backwards trying to find a rug that works with it! If I get it I’ll be sure to let you know how it is as far as quality! ooooh lisa, i love this plan! the colors and that mirror! I know you will make it fabulous and I’m looking forward to working alongside you! 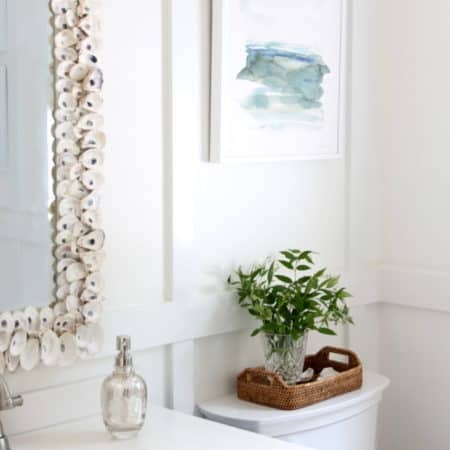 Love that oyster mirror- I have a bucket outside waiting for some diys this weekend! Katie can’t wait to commiserate with you! Your blue & white dining room plan sounds right up my alley – maybe you will come do mine next!! The square board and batten will have such a nice impact. Good thing you’re removing the toilet so it will be easier to install behind it. Excited to follow along another ORC bathroom project! My square board and batten plan didn’t work out, so I’m saving that idea for another room and moving onto plan b. Thanks so much for stopping by to check it out! I love your design board and I’ve been eyeing up that Gentleman’s Grey for awhile, so I’m excited to see it come together in your space. 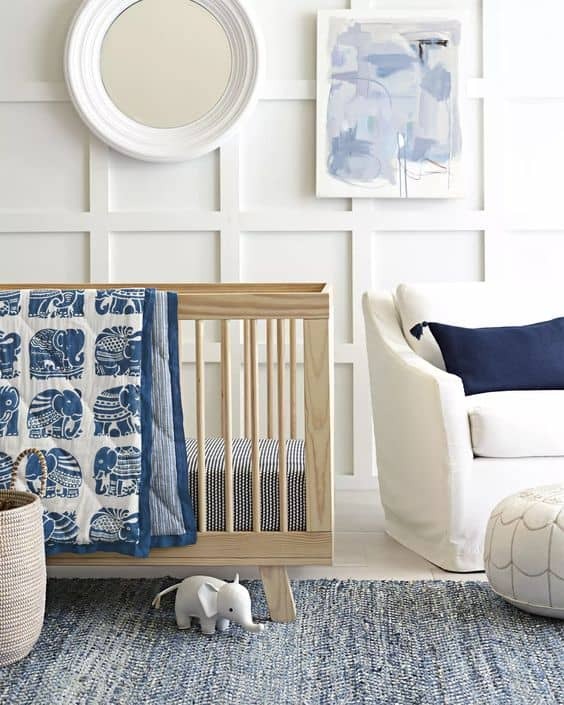 Love the idea of the board and batten styled wall too. Yay! So excited to be able to cheer you on from the sidelines!! It’s going to be beautiful! Denise thanks so much my friend! It’s moving slowly and I hope I make it to the end! 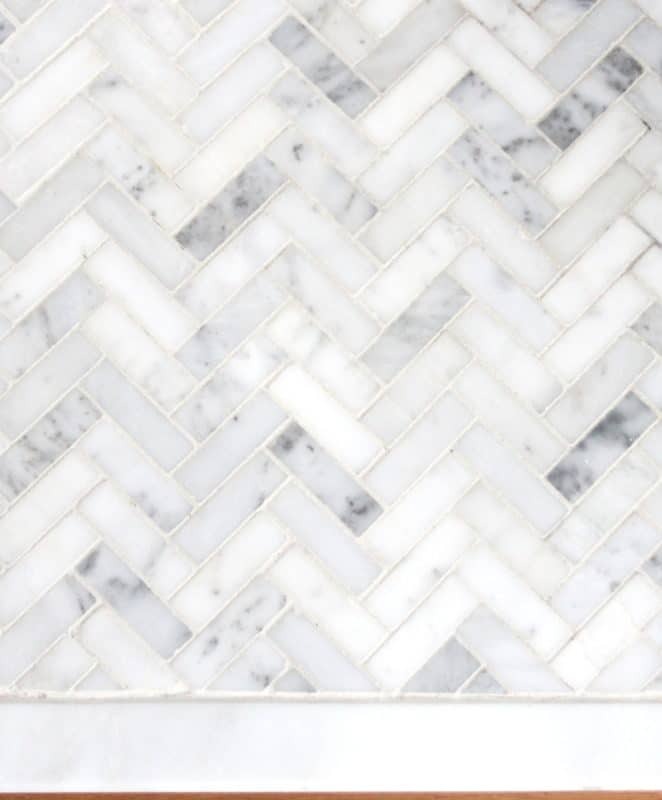 The marble tiled floor is the wild card….I would love to do it if I can fit it into these 6 weeks! I am looking forward to following along as you shine your light on that little bathroom! 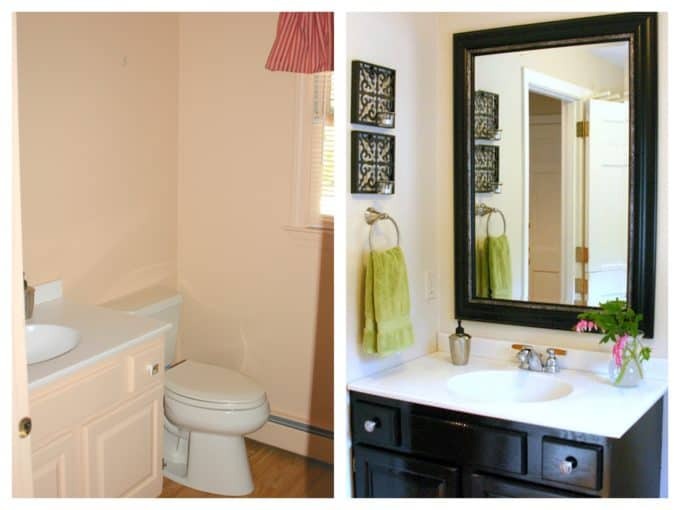 Even the simple changes you made from the original VERY peach bathroom are amazing! You are so talented, I always enjoy seeing what you’re up to! Ps our snow is almost gone after yesterday’s crazy rain and thunder/lightening – I should be able to get out to the garden on Sunday, I’m hoping! Lisa, I can’t wait to see your carpentry skills in action (once again) on the board and batten! It’s going to add so much depth and dimension. Beautiful design plan – love the color scheme! So glad to do this ORC round with you! Lisa I crack up every time I see those old peach pit pictures 🙂 I LOVE your idea for the wall treatment – I’ve admired that same Serena & .Lily image and think it could be really phenomenal! You got this!! I know – the peach thing was pretty amusing – it was seriously everywhere. My husband thought I was CRAZY that I wanted this house! This room is turning out to be quite challenging for the square board and batten but I’m determined to do it somewhere! 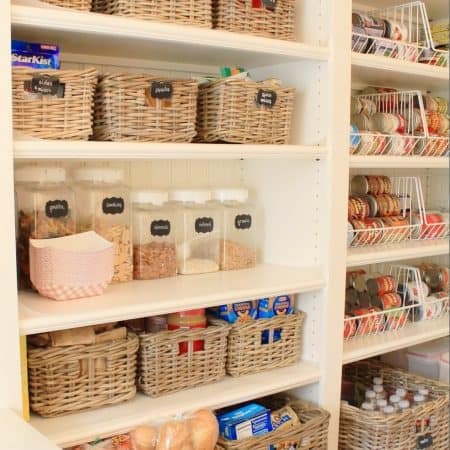 I love how you are planning your space! We are also doing a bathroom for the ORC and making the board & batten walls. One thing we had to do to navigate the same toilet situation you have, was to literally remove the toilet tank. It looks scary, but my husband claims it was worth the effort! Oh I totally understand the mulling about it part! Looking forward to seeing your project this week! Love your design for the bathroom! Gorgeous balance of color and materials. Looking forward to following along! Thanks so much Joy! I’ve hit some roadblocks this week but hopefully I’ll get this room finished by the end of the ORC! Sarah you are always the most enthusiastic co-challenger and cheerleader! Thank you! Can’t wait to see your progress! i cant wait to see this room unfold. its going to be gorgeous!!!! !